Could the Senate start getting things done, if only legislators didn't have to face filibuster threats? This week on The Breakdown: the history of the filibuster, and how to get rid of it. Plenty of criticisms have been leveled against the United States Senate, but perhaps the most accurate and deserved is that it seems incapable of achieving anything substantive. Many blame the filibuster, once an infrequently used procedural technique that has become a de facto legislative obstacle. 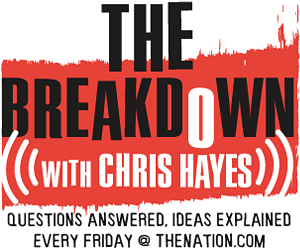 This week’s Breakdown, with DC Editor Christopher Hayes, takes a quick tour through the filibuster’s history and the options for its removal or amendment. Congressional Research Service Report on ‘Changing Senate Rules. Graphs demonstrating increased use of cloture and filibuster. Christopher Hayes on the Rachel Maddow Show discussing the filibuster.